November | 2011 | E-verything! We were a small group this week, however as usual the session was recorded, so if you missed it you can catch the recording. The session followed the usual Serendipity format with a whiteboard for topic ideas from participants and then a poll to choose the topic for discussion. The consensus was for us to merge two topics “Tech toys for motivation” and “Cool tools” and talk about and share some of our personal favourites. When it came to my turn rather than just talk about a tool I Application Shared Wordle – one of my personal favourite “cool and motivational tools”. Then we took turns to have control of desktop so everyone could add their own choice of cool tools. 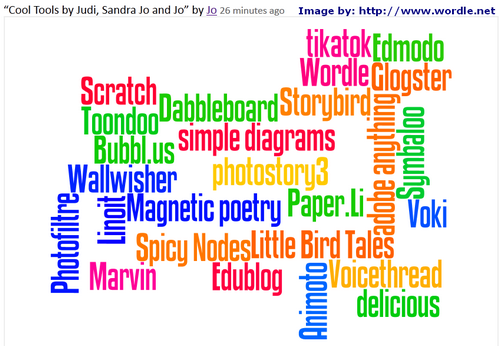 Thus we were able to build a collaborative “Cool Tools” wordle of some of our favourites. We had time for a further “round” of sharing. Once again each briefly talking about a tool of our choice, with some Application Sharing and links shared in text chat. This session was a great one to be part of! As usual with sessions where we share favourite tools there were ones new to me, so I have new tools to explore. Edublogs webinar overview – Do you know Dabrowski’s Dogs? 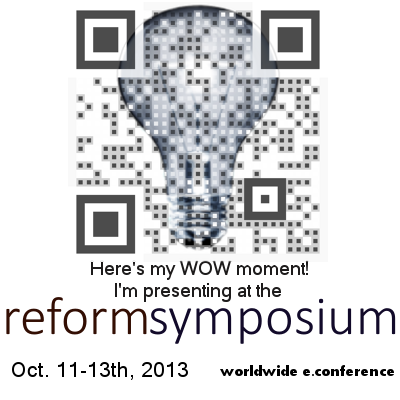 This recorded, Fine Focus session presented by Jo Freitag (@jofrei) was fascinating and exciting. Jo coordinates the “Gifted Resources” information service website which includes “Sprite’s Site” where Dabrowski’s Dogs are regular visitors. She has intrigued us with mentions of Dabrowski’s Dogs in a number of sessions so it was particularly exciting to have a session devoted to them. Jo started off by finding out where we were coming from on “Dabrowski’s Dogs”. She then gave as a great list of references so that we could find out more about the overexcitabilities for ourselves at a later stage. Next we took a look at the dogs themselves as personifications of Dabrowski’s overexcitabilities. Jo gave us great character sketches of the dogs and also links to blog posts that explore the characterisitics. Then it was our turn to do some work. Jo gave us slides on which to brainstorm the positives and negatives of the overexcitabilities in a classroom context and to suggest strategies for managing these. The first of these slides is shown above. This activity was a great tool for thinking about the impacts of the overexcitabilities in the classroom context and for considering how they might be managed. As well as the whiteboard input there were also ideas shared in text chat. Jo also talked briefly about a teaching unit that can be used to help students better understand themselves. 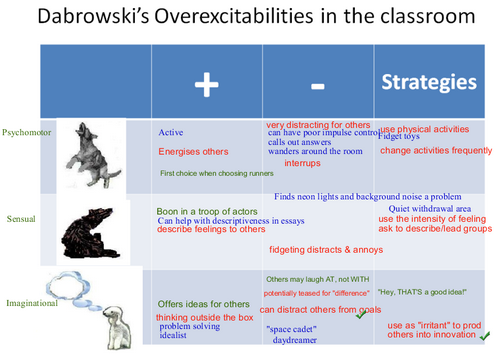 Finally Jo asked us how we felt at this stage about Dabrowski’s Overexcitabilities which gave rise to an additional whiteboard activity for us to express whether we could see echoes of ourselves in the dogs. This was a fantastic session – full of information and activities and with lots of interesting “homework” in the form of links to visit later. As always I learned much! It seems to me that a virtual classroom might have some advantages over a face-to-face situation for managing some of the negatives (particularly those characterisitics that prove distracting to others) posed by the overexcitabilities. Our next session will be an Edublogs “Serendipity” session on Thursday November 24that 23:00 GMT/UTC (Afternoon/Evening USA) or Friday November 25th at 7am West Aus, mid morning Eastern States Aus depending on your timezone (check yours here) – in the usual Elluminate room. This is one of our fortnightly unconference sessions where we invite you to bring along your “hot topics” and “burning issues” for our poll on the topic. For this exciting recorded unconference session Tracy Watanabe (@tracywatanabe), who is Technology Integration Specialist at Apache Junction USD in Arizona, was our guest facilitator. Tracy is a regular attendee at both Serendipity and Fine Focus sessions and did a great job in keeping the session flowing smoothly and picking up on questions in textchat. A number of Tracy’s colleagues participated actively in the session and for most I believe it was their first webinar! This session had a great blend of textchat, audio and whiteboard contributions beginning with a whiteboard and discussion about ideas for projects that could form the basis of project based learning in difference disciplines. 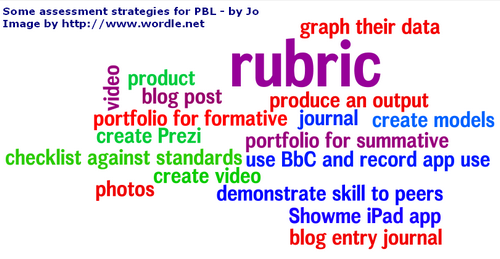 Participants shared examples of how they are using PBL with their students. Again this generated lots of ideas, some captured on the whiteboard, others through textchat and audio. Comments from others brought home to me how lucky I am to be in the outcomes based Vocational Education sector here in Australia. Standardised testing is not something we have to do! Our students have to meet standards but the emphasis is on being able to demonstrate that they can do something and that they have the necessary knowledge to do this in a work context. Having said that, we are still bound by “curriculum” and time constraints into teaching/training to meet outcomes rather than to develop our learners. This was such fun! I love it when someone else is the primary facilitator because it gives me a little time to participate in the session so I can add my “two penn’orth” (“two cents worth”). This was a great ideas sharing session where the diversity of participant experience ranging all the way from primary to adult education, of sector (school, non-formal and vocational education) and jurisdiction (Australia and USA) gave rise to a variety of project ideas and assessment strategies. This Fine Focus session, recording here, was similar to one I did recently with colleagues. I am currently introducing some Web2.0 tools to some of my colleagues and Facebook is one of these. The session was fun! I used video and application share,I had intended a web tour also but BbC wasn’t co-operating so the web-tour became another applicaion share. We started with some general discussion about Facebook and moved on to some of the uses and pros and cons of using with students – including the fact that it is a “place” where many students already “hang out”. Next we took a look at some of the practicalities of using Facebook in education and the issues around privacy and confidentiality. 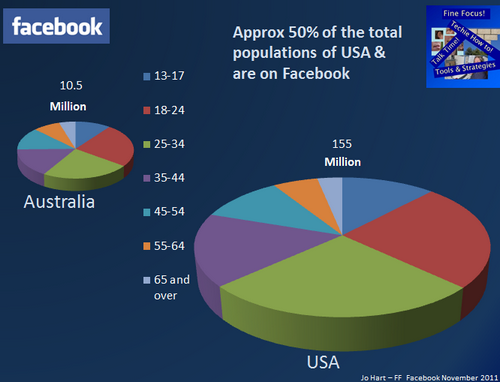 This included a look at the practicalities of having a second account and the advantages of groups over fan pages. We finished with a quick look at the need for management by group owners to ensure that behaviour remains acceptable. I felt that I talked too much in this session – something I often feel to be the case when I am the “presenter” as well as the facilitator. However text chat was active and there was great input on whiteboards so the session seemed to be effective. Also as usual I tried to include too much! So the session was a bit rushed towards the end. Our next session facilitated by Tracy Watanabe (@tracywatanabe) one of our regular participants will be an Edublogs “Serendipity” session on Thursday November 10that 23:00 GMT/UTC (Afternoon/Evening USA) or Friday November 11th at 7am West Aus, mid morning Eastern States Aus depending on your timezone (check yours here) – in the usual Elluminate room. This is one of our fortnightly unconference sessions where we invite you to bring along your “hot topics” and “burning issues” for our poll on the topic.